Profitability, one would think, should come quite naturally to a successful, growing SaaS company. But, SaaS startups have consistently struggled to reach profitability. Unprofitable SaaS companies have gone public and remained unprofitable for years after their IPOs, even as they grow revenues into the hundreds of millions of dollars. SaaS companies have eschewed economic convention, with management and investors alike calmly shrugging off the passe’ advice of their obsolete microeconomics professors who cry out in vain from their blackboards that “the role of the firm is to maximize profit.” Many authors have tried to make sense of this morass, two of the more interesting attempts are Bob Warfield’s post entitled Why do SaaS Companies Lose Money Hand Over Fist, and this really cool analysis by Christian Chabot of tech IPOs comparing software companies that were profitable to those that were not profitable at the time of their IPO. And, I’ve certainly made no secret of my own opinion in posts like this one entitled SaaS Failures – The Recurring Revenue Mirage. This is the third post in a series on SaaS metrics that will unravel the mystery of SaaS profitability (and the lack thereof) from a different angle, a little mathematics. Once and for all we’ll solve the puzzle of why seemingly successful SaaS companies lose money. So, even if you’re not a math junkie like me, please be patient and plough your way through the technical mumbo jumbo. I’ll guarantee some of these results will surprise you! SaaS profitability is such an important topic that I’m breaking it up into three separate posts (this being the first) that will build on each other by examining three increasingly complex scenarios: 1) stable growth with churn, 2) viral growth, and 3) growth through upselling and upgrades. Along the way, I’ll also introduce a number of new SaaS Metrics Rules-of-Thumb that highlight the impact of customer acquisition costs and recurring cost of service on long term SaaS profitability. This subtle, strikingly simple rule will reverberate through all that comes to follow on SaaS profitability. 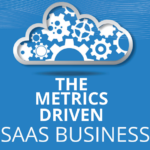 And, it provides a simple sanity check for predicting when, if ever, your SaaS business will reach profitability. The gist of the rule is that your SaaS recurring revenue over time is nothing more than the sum of its parts. Therefore, the sooner you break even on a single customer, the sooner you will reach profitability as a company. 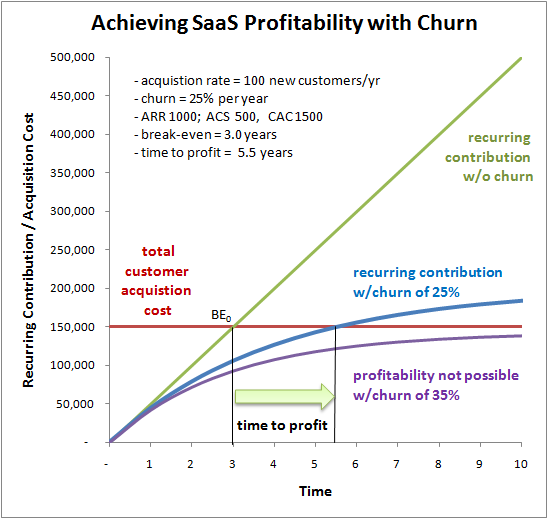 The chart below visually shows this principle for a SaaS company with a constant rate of customer acquisition eroded by churn which was closely examined in the first post in this SaaS metrics series. directly linking company time to profit with customer break-even time. Where “CAC” is the average acquisition cost per customer, “ARR” is the average recurring revenue per customer, “ACS” is the average recurring cost of service per customer, and the 0 attached to the BE is intended to indicate the absence of churn, i.e., the baseline break-even. Where C is the number of customers and ΔCnew is the new customer acquisition rate. Time to profit occurs when this expression changes from a negative loss to a positive profit, or when profit is equal to zero. In this simplest of cases, time to profit not only follows break-even, it equals break-even. This relationship between company time to profit and break-even time for the single average customer is a completely general principle for SaaS (or any recurring revenue subscription business). Unfortunately, the simple case scenario above is also the best case scenario as spelled out in the next SaaS metrics rule-of-thumb. SaaS Metrics Rule-of-Thumb #2 – New Customer Acquisition Growth Must Outpace Churn states that if you want to break free of the churn limit, then you must increase new customer acquisition to compensate. Unfortunately, this mandate places you neatly between a rock and a hard place with respect to profitability. On the one hand, your customer acquisition costs increase each year, while on the other hand churn is eating away at your ability to break-even on every new customer you bring the door. The net result is that both churn and growth push SaaS profitability out beyond the single customer break-even point in direct relation to their intensity. 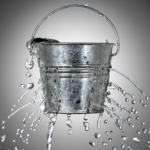 The higher your churn, the longer it takes to reach profitability. The higher your growth rate, the longer it takes to reach profitability. And, if either your percentage churn rate or growth rate are too high given your customer acquisition cost and recurring contribution, your SaaS business will never reach profitability. The chart below shows this general principle for the simple case of a constant new acquisition rate subject to churn. 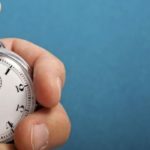 the best case time to profit is the average break-even time for a single customer. If churn is too high, profitability becomes impossible to achieve. Because we are following SaaS Metrics Rule-of-Thumb #2 – New Customer Acquisition Growth Must Outpace Churn, the new customer acquisition rate, ΔCnew, is always increasing. Since C is just the sum of all the customers acquired at the lower acquisition rates from earlier times, then had we acquired customers at the current acquisition rate the whole time, we would clearly have acquired more customers. What does it mean? 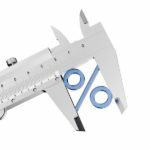 In a subscription business, you reach profitability when the contribution from current customers covers the acquisition cost of new customers. This is the essence of SaaS Metric Rule #4 – Company Time to Profit Follows Customer Break-Even. In the base case, everything is constant and customer break-even = company time to profit. But, if you lose customers to churn on the revenue side, while you acquire new customers at a faster rate each year on the cost side, then it takes more current customers to cover your new customers, so the faster you grow, the longer it takes to stack up enough customers to cover your new ones. If you grow too fast, you can never catch up, and you’ll never be profitable…unless you stop growing! Or, you take action to reduce costs. This is the topic of the next installment in the series: Growing Up Poor – How Foolish SaaS Companies Lose Money. 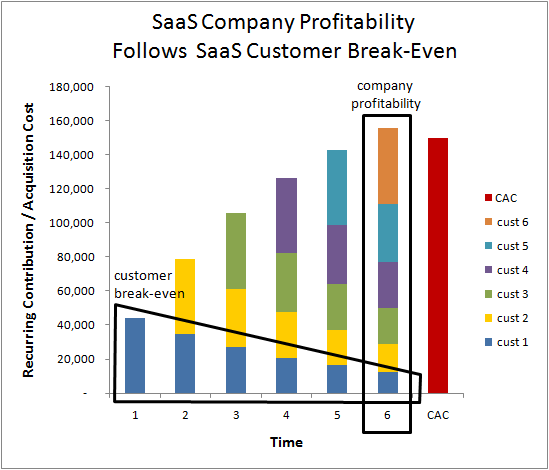 2. to consider the fact that in order to be successful a SaaS company’s CAC should decrease dramatically over time. if it does – thats where the profitability should come from, the idea is that CAC should be lower then even a single year’s income from a given customer. if it does not converge to this – then its a giant challenge since you will always need X salesreps/marketing.expenses/etc per Y customers. Yes, SaaS companies do have to deal with the fact that expenses are frontloaded while income is backloaded. but…. 3. individual companies’ CAC should get shorter if they can properly target their lead generation machines and more importantly – fine tune their sales cycles. Joel- Great post for anybody running a SaaS business. Still chewing on the point you made about the rate of growth negatively impacting time to profit, but Benny’s comments above clarified some of it. Afterall, isn’t SaaS inherently based on the promise of economies of scale? In other words, wouldn’t you anticipate both your acquisition costs, as well as your service costs to reduce over time and with a growing customer base on a per-customer basis? 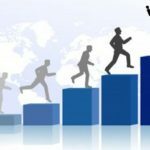 Certainly, growth will cause increases to your cost structure, when you have to add that extra server, or hire that extra person, but should be absorbed by the customer base provided your growth continues and the contribution per customer covers more than the variable costs per customer, no? Thanks for putting the math together – extremely helpful. Creating economies of scale to lower total cost of service (both CAC and ACS) is a central theme that I plan to drill down on in the next post in the series, and is essential to accelerating profitability. WRT the model itself, I made a conscious choice to use “average” CAC/ACS values and exclude fixed costs for a number of reasons (fixed relative to increasing customers). a) Use the approach of 1 above and say, “OK, these results are bad, how can I improve them?” Make a change, recalculate the average values, and run the model again. but including explicit economies of scale in the math gets really indecipherable without much new knowledge. c) Treat fixed costs as external, and then the BE0 is not actually breakeven, but the point at which you’ve covered your variable costs…and can now start thinking about covering your fixed costs…so true break even would be longer (again variable/fixed with number of customers)…again, I chose a) to keep the model simple. in customer acquisition, onboarding, support, etc. scale directly with the number of customers when they are done by people, manual labor. Scale economies require process automation and customer self- service…which is hard work. So, back to 1) and the approach…what happens if I don’t create economies of scale (I use of the word “create” intentionally to emphasize the point). Thanks for the question. Apologies for the lengthy answer. Great post. I think people put too much faith in scale economies reducing variable costs such as CAC. If the math doesn’t look good fairly early on, as a VC, I don’t expect it to get dramatically better later (it could happen but I would not count on it). As companies grow to large scale, I’ve always been amazed by how much they keep spending on marketing/sales. The most easy examples are in consumer businesses where billions get spent on advertising but I think its true in SaaS and B2B in general. When calcualting CAC are you using the fully loaded cost of Sales and Marketing including sales base salary and commisions and all marketing salaries & expense? And Total Cost of Service are the expense directly realted to onboarding and supporting that customer going forward? All these subtractd from Revenue effectivly reveals contribution margin? which is what we have left to pay fixed overhead (G&A, R&D, etc.) and make a profit?